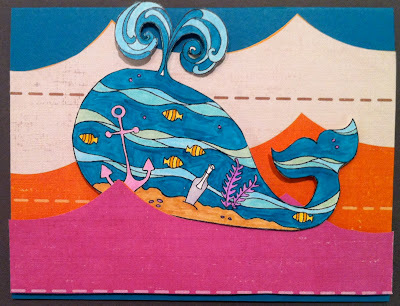 Donna's Crafty Place: Whale Wishes! I made this card for this week's Impression Obsession Challenge. It's to use your favorite Impression Obsession stamp and of the ones I have I think the whale is my favorite followed closely by those mermaids! Thanks for taking a look. OMGosh, Donna, thank you so much for playing. I love your modern whale! How perfect! I have this stamp and now I know how to use it!! What a great take on it and a beautiful card too! Good luck in our drawing too, Donna! Donna, this is just FUN! Love the bright bold colors with the whale --- makes me ready for summertime! Fun stamp! Love the brightly colored waves. :) Thanks for playing along with us!